Today we have a guest post by Andy Walpole sharing his experience from creating the Lightbox Ultra on Mozilla Demo Studio. Several years ago developer Lokesh Dhakar created the familiar Lightbox script with Prototype and script.aculo.us. It’s smooth animation and sleek aesthetics were an instant hit in the web design community and it was used on a multitude of different projects. There have been many imitations – Fancybox and Thickbox to name just two – but Lightbox still remains as the favoured way to present images to a user. This, primarily, is due to its 3d animation and background dimming which allows the user to view the image without any distraction. It’s a useful, timeless technique. This guide is not a line-by-line explanation of the code I have written for my Lightbox project. Going into such tiny detail will only confuse the reader. Instead, I’ll explain some of the key concepts behind creating a modern take on the popular Lightbox script. That way you can then use these ideas in your own coding projects. I used definition lists but I could have as easily used unordered lists. 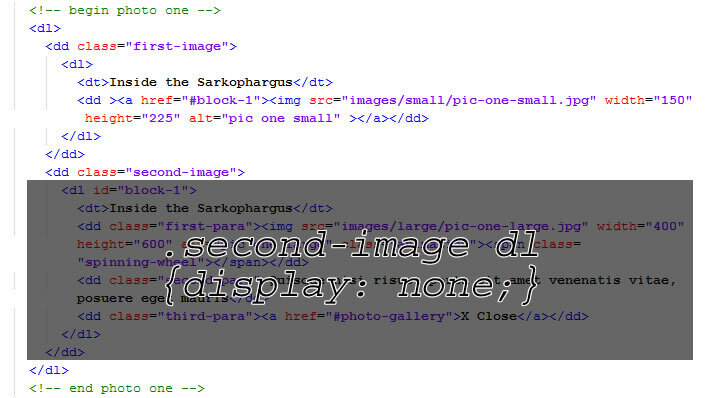 Note how the HTML code block for each image is split into two different parts – one for the thumbnail and the other for the full sized image. The Lightbox approach is for the full-sized image to appear after user interaction with the thumbnail. :target works by using a fragment in the URL. The link in the thumbnail has the following fragment: “#block-1”. The ID for the full size image is block-1. Clicking on the link with the fragment then triggers the HTML with an ID that is exactly the same as long, of course, as you specify this in your style sheet. Because it is so different to other CSS, :target may appear a little confusing at first. The best method to become familiar with it is by rolling your sleeves up and experimenting with this pseudo-class on your own code. 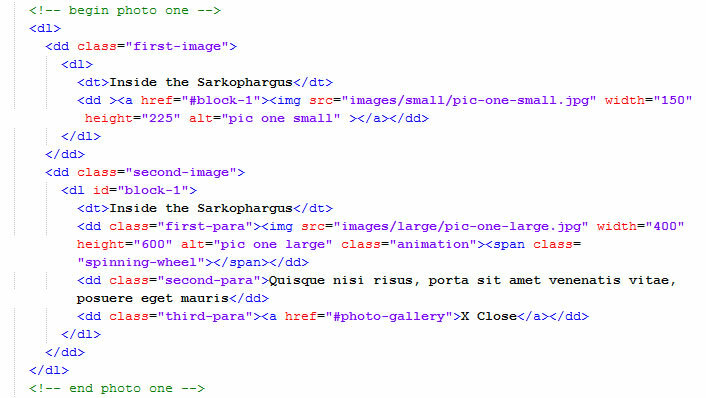 :target will become one of the most used CSS3 features in the future. The reason it has only had limited use so far is that it is not supported in Internet Explorer versions 8 and below. I’ll discuss workarounds in the next section. I will not explain the code above in detail because this article isn’t a tutorial on CSS3 animation. For that I would advise you to read introductions written by Tim Van Damme, Louis Lazaris and Tom Waterhouse. Note in the code above I used Webkit, Firefox, Microsoft and Opera prefixes. As of yet there is no keyframe support in Internet Explorer or Opera but it will be coming soon so it’s best to future-proof your code. However, there are are number of pitfalls with a CSS-only approach. Firstly, CSS3 animation only fires once. This is an issue previously well documented by Oli Studholme and Chris Coyier. I’m sure you could write less verbose code if you used jQuery. The second issue facing a CSS3 Lightbox is the lack of support in Internet Explorer. Unfortunately, versions 8 and below do not recognise the :target pseudo-class. One way around this is to use a polyfill such as Dean Edwards IE7.js or Keith Clarke’s Selectivizr (the latter has support for IE8 only). As the Sizzle engine has full CSS3 support I presume as well that you can use jQuery or Dojo. If a browser does not recognise a CSS pseudo-class or pseudo-element it will parse out the entire block of code. That means it is not possible to change the CSS using the styleSheets object because the CSS block using :target is not there to alter. My solution was to use the XMLHttpRequest API to save the stylesheets to memory, change :target to a class called ieTarget, remove the old style sheets and then add the new altered CSS to the head. The ieTarget is then dynamically added and removed from the HTML depending on a click event being fired on the thumbnail or full-size close link. Admittedly, it is quite a drastic move and one that leaves open all sorts of potential bugs and issues. If you do use CSS 3d animation then do so with caution. I think it is important to use it subtly rather than creating some garish 360 plus flipping and twisting. To do so would put the animation at the centre of attention rather than the images that are being presented. On Firefox it looks good. Wahab, it’s not going to work the same in Opera as Firefox because the Full-screen API is, so far, only available in Firefox and Webkit-based browsers. Not working properly in latest versions of Chrome or Firefox. Didn’t have behaviors I would expect from a lightbox at all. Couldn’t navigate using the gallery at the bottom on my 768 height screen since only a bit of the thumbnail showed. Didn’t have the standard arrows that appear on hover over the image to move from one picture to another either. So basically, I couldn’t navigate at all. Pretty awesome tutorial, Thanks for sharing! I recommend correcting “pejorative” to “prerogative” since they mean very different things :) there are also some other typos (including an it’s/its) so maybe you’d like to do a once-over. Thank you for the article. Its working nice in firefox. Thanks for this tutorial. I wanna work in other browsers. Hope it works. Thanks!!! it works wonders, I’ve been looking for a modern lightbox like this! I will for sure implement!! Well, it really works for me for any browsers, this tutorial is really a good idea for us web designers.. Thanks for sharing it.. Very informative post and i have implemented it also. It feels good to say that works for any browser. Thanks Andy. It doesn’t work properly in Firefox. And the inability to go through images with a mouse click or keyboard doesn’t make any sense. Really over-designed. Just because you can do something, doesn’t mean you should. I would say that this actually enhances the worst aspects of lightboxes. Nice effort, but designers should think carefully before implementing something this over-done. A good example for the implementation you have certainly packed a lot in. Thanks for this awesome tutorial, liked the CSS. I can’t wait for CSS3 to be fully supported or until people stop using the older browsers. Great post! Really great lightbox! Good to see that CSS3 is finally coming! css3 is new and I get that “it’s the way of the future” but I prefer backwards compatibility. Using methods only supported by new browsers seems like a bit of a waste if you plan to grow your site and make it very popular. Well, I guess it’s only a waste if conversions/sales matter to you – my personal opinion. Thanks for the nice post :) this is great! Really nice post shared by you. With the help of css3 we can make many creative things like button, menu as well as slider also. Also i would like to use this new things. really nice and informative post thanks for sharing it. Keep up. nice effects :) great job. Many thankx buddy. Shrink, Share & Get Paid! Go To http://netfly.com/?r=1 to get paid for your posted links! I see this CSS3 light box and I hope this will work out for all developers. Now I will start trying to integrate in local and I will try to get live once it’s done. I got lucky to get this new light box with full screen mode. Thank you once again for this nice post and I am awaiting for new articles soon. Im searching for this! Thank you Andy! Nice effect! But I’m more worried about the browser compatibility issue. Nice effect! This could be the next lightbox style effect. CSS3 is definitely taking it’s place. I’m curious to find out what blog platform you are utilizing? I’m experiencing some minor security problems with my latest site and I’d like to find something more risk-free. Do you have any recommendations? be a excellent case study? I just love to use lightbox! It makes a simple site looks great! im loving and zhetenging it now. Hello! I could have sworn I’ve visited this blog before but after going through a few of the articles I realized it’s new to me. Thank you for sharing your knowledge. Pretty useful information indeed. Really great, Well done for your ideas on the review %BLOG TITLE%, they happen to be quite effective. I appreciated reading your write-up. What’s up everyone, it’s my first visit at this website, and piece of writing is really fruitful in support of me, keep up posting such articles. Great. Thank for sharing ! This is a cool tutorial. It’s very impressive to read. I am happy that we can also get codes from here. I definitely need to sort that! Working as a newbie in a professional website development company.